Following on from the excellent ‘Killer Intent’, barrister Michael Devlin is now settled into a relationship with news reporter Sarah Truman. But you know how crime writers are averse to calm and conviviality? Enter a pale-eyed killer with a long list of victims, and now starting a mission of revenge that will be undertaken, with ruthless vigour. First up is Phillip Longman, a retired Lord Chief Justice. His grim crucifixion is assigned to DCI Joelle Levy, formerly of Israeli Special Forces. The only lead comes from the subsequent murder of a former solicitor. The link between these two killings draws the attention to news reporter Sarah Truman, as it’s obvious that the Police are trying to track down a very skilled, and highly motivated killer. However, for Devlin, the realisation that this points to a deeply guarded secret from his own past, adds intrigue and a possible window into the killer’s identity. Running concurrently Devlin is at work in the Old Bailey. His client, is involved or not, with a gangland murder. Will his client give evidence against the other accused party? Can Devlin muddy the waters with mobile-phone mast usage? And is his client really the innocent party as he claims? When another murder occurs, Devlin makes a connection and is convinced he knows the killer’s identity. Though, he will have to reveal his own link to the killer, and the long-held secret in order to convince the Police. Whilst the court-case doesn’t have the immediacy of the murders, it serves as an illuminating, and pacing counterpoint, casting both light and shade over the proceedings. DCI Joelle Levy is a welcome addition to the ensemble, and I trust we’ll see more of her. What’s not to like about a strong female character, with a very useful skillset? The killer is heartless, cold-eyed and utterly bent on revenge - skilled, resourceful and utterly relentless in his mission. 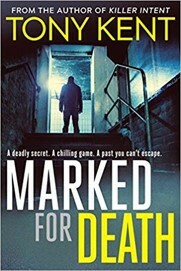 Tony Kent’s insight into the legal machinations are encyclopaedic, injecting depth and realism into the courtroom drama. These scenes also serve as calmer waters for the reader, as the Police-hunt for the killer gathers’ momentum, reaching a perplexing climax. This is a tremendous follow up to ‘Killer Intent’. We already knew that Devlin is a Lawyer with a past, but that past has now come back to haunt him.